Page F30: NASA budget too slim to reach Mars. And the Moon. Also too slim to protect Earth from massive asteroids. NASA budget too slim to reach Mars. And the Moon. Also too slim to protect Earth from massive asteroids. Two articles from space.com worth mentioning today - this one that says that not only does NASA not have enough money to reach Mars but also not enough to reach the Moon by 2020 as planned. And this one says that NASA isn't being given enough money to discover and track potentially lethal asteroids in spite of the fact that it was told to do so by Congress in 2005. 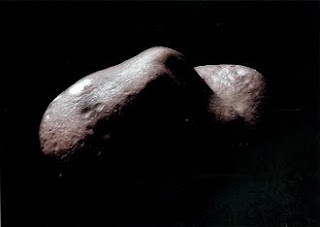 My proposed solution to the first problem is to first send humans to a near-Earth asteroid or two, if possible to one with a moon or two of its own. The reason for this is that it is quite easy to do compared to colonizing the Moon, and thus can be done soon after NASA develops the capability to send manned missions after the Shuttle retires. A mission to an asteroid would be a completely new area to explore, would take a few months to accomplish (a few weeks there, some time on the surface, a few weeks back), would be easier to do than a trip to the Moon, and hopefully significantly raise public support for NASA in a way that only a new destination can. And if that doesn't work? Then colonize a place like Cruithne for a year or two. Though it would result in astronauts being much farther away from Earth during the mission, it may still be an easier destination to colonize than the Moon since the trip back home would be a simple "undocking" process, compared to the Moon where the module to take the astronauts home weighs about 5 tons. That extra 5 tons can be put to other use when exploring a destination with minimal gravity. I'm still convinced that we will get back to the Moon by 2020 though, due to a kind of perfect storm of discovering Earth-like planets in other solar systems, private space development, and hopefully a bit of friendly competition with nations like China. As for the second article, in the absence of any real funding we'll just have to hope that we don't get hit by any large rocks that haven't been discovered yet. Some space advocates actually hope that we get hit by an asteroid, not large enough to cause any phenomenal damage but just large enough to scare us into action. Something about 20 metres in diameter for example and with enough warning that it makes the front page for every day until it hits. The most likely locations for an asteroid hitting the Earth would be the ocean, followed by uninhabited locations in areas like Russia and Canada, but the realization that there actually are huge rocks out there hurtling at phenomenal speeds would be a big deal for how the public views space.